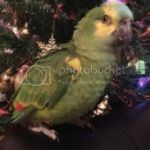 - Does my lovebird need to be flight trained to use it? - If a parrot just decides to start flying won't the harness hurt them? - And finally, is it safe to take my two lovebirds out at the same time after they are trained? Don't do harness on lovebirds. As much as I love using the harness and taking birds outside, lovebirds are just too small. You can easily take a small cage or carrier and take them places with you while securely put away. Lovebirds in a harness are like a child in adult clothes. It's just not a good idea. I know there is, I sell it. But it really isn't all that suitable. You'd have to see it to understand. Michael wrote: I know there is, I sell it. But it really isn't all that suitable. You'd have to see it to understand. That's too bad, I was really looking foward to teaching them to use a harness, but if you think it's better to take them outside in a small cage, I'll do that. Personally, I would not harness anything smaller than a Cockatiel. Ok, thank you so much for the help! Michael wrote: Personally, I would not harness anything smaller than a Cockatiel. Mango is smaller than a Cockatiel and uses the X-small but with a Lovebird I could see how it might be difficult if they start flying since they are so small. I wouldn't put a harness on any of the small aviary species. There is no benefit to them - only stress and discomfort. Pajarita wrote: I wouldn't put a harness on any of the small aviary species. There is no benefit to them - only stress and discomfort. No bird would be stressed if they trusted you and were harness trained, My tiels love going out which are small aviary species.